In a recent study, 125 amateur cyclists aged 55 to 79 were analysed and compared with healthy adults from a wide age group who did not exercise regularly. The findings showed that the cyclists preserved more muscle mass and strength with age, while maintaining stable levels of body fat and cholesterol. In men, testosterone levels remained high. The anti-ageing effects of cycling also appeared to extend to the immune system. The thymus, an organ which makes immune cells called T-cells normally starts to shrink from the age of 20. But the thymuses of older cyclists were found to be generating as many T-cells as those of young individuals. Director of the Institute of Inflammation and Ageing at the University of Birmingham, Professor Janet Lord, said: "Hippocrates in 400 BC said that exercise is man's best medicine, but his message has been lost over time and we are an increasingly sedentary society. "However, importantly, our findings debunk the assumption that ageing automatically makes us more frail." Male cyclists taking part in the study had to be able to cycle 100km in under 6.5 hours while women had to cover 60km in 5.5 hours. The non-exercise group consisted of 75 healthy people aged 57 to 80, and 55 young adults aged 20 to 36. 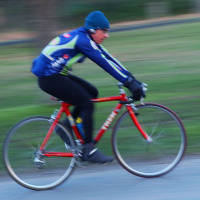 Professor Stephen Harridge, director of the Centre of Human & Aerospace Physiological Sciences at King's College London, said: "The findings emphasise the fact that the cyclists do not exercise because they are healthy, but that they are healthy because they have been exercising for such a large proportion of their lives. "Their bodies have been allowed to age optimally, free from the problems usually caused by inactivity. Remove the activity and their health would likely deteriorate." The research is outlined in two papers published in the journal Aging Cell. Planning an active trip away? Sort your travel insurance package to include participation in all sports and activities.